This custom reflects the spirit of Kendo. Using bamboo sword instead of steel sword,kendo came from kenjyutsu:kind of fencing only for samurai. Players are held in 9-11 meter square area. Players starts bowing each other,and end of bowing each other as etiquette. Then, they aim to strike on opponent’s body. When they strike, they call out the name of the strike zone where they strike on. If player strike on any other body parts, it would not count as point. Match itself is 5 minutes long. Player who scored first 2 points is the winner. The ranking is determined by ability (skill), length of time dedicated to the sport. Beginner is called seventh kyu. Then, they take tests to level up themselves all the way up to the first kyu. After first kyu, they move on to “dan” (name of the ranking) starting from ichi dan (1st dan) all the way up to 10 dan. What Kendo can teach kids..
Japanese traditional sports such as Kendo, kyudo (archery), Jyudo etc teaches kids great deal when it comes to mental education. The mental and physical benefits of training Kendo as such are: improved focus, spirit, strength, endurance and overall fitness are well known in Japan. Therefore many schools in Japan has Kendo , kyudo, jyudo after class club. The Kendo Championships are major sporting events in Japan and the major championships take place in Nippon Budokan, the main arena for the national championships of Japanese martial arts. Here is the youtube video you can watch to see what Kendo is like. Here is the good video to see how match starts from Rei (bowing). Kendo match starting with bowing..
Judo , literally translated from Chinese character to English it means meaning “gentle way”) is Japanese martial art/sport. It is also one of summer Olympic game sports. Judo became Olympic sport in 1964 at Tokyo Olympic. Judo was developed as samurai art of self defense in Edo period; 1600-1868. Using Judo, one can defend oneself from attack,catch the opponent and defeat him without the use of weapons. In the early Meiji period (1868-1912), Kano Jigoro not only established the Judo as sport but also founded Kodokan Judo,which aim for both physical, mental strength/discipline. Kano Jigoro set up a system of ranks (dan) and class (kyu) as encouragement for his disciple and, the system still is used many years later. A match is fought within 9.1 m x 9.1 m area. Length of the match is anywhere from 3 minutes to 20 minutes. The player who defeated the opponent by nage waza (throwing) so that he/she lands facing upward from the mat: or Katame waza ; (grappling) submission, and hold him/her more than 30 seconds ,win by ippon. Instead, judo simply involves two players by gripping the judo uniform or judogi Eri (collar), use the forces of balance, power, and movement to attempt to subdue each other. Often times, this technique is used when opponent is off balanced to the front or back. One of famous female Judo Olympic medalists is Ryoko Tamura (currently Ryoko Tani). Ryoko started Judo when she was 2nd grader,and at the age of 15, she entered in to Fukuoka International female competition for Judo and she won championship (youngest among the contestants). She was skilled in speed and great sharp performance/technique. Below is at Athens Olympic 2004, where she won Gold medal.Look how fast she goes..
Ryoko Tani wins gold medal.. If you were asked to name a few Japanese sports, sumo might be one of the sports name you might name. Sumo is a competitive traditional national Japanese sport where wrestlers,who only wears belly belts (mawashi) in the ring, tries to push opponent wrestler out of a circular ring or touch the ground with anything other than the soles of his feet. Originally, sumo was used to measure the wrestler’s strength or for dueling, but it is now professional sport in Japan. Most sumo wrestlers are required to live in sumo training stables, known in Japanese as xyz (owner’s name) beya. Their daily lives—from meals to their manner of dress—are dictated by strict tradition. Nihon Sumo kyokai (Japan sumo association) holds 6 tournamenta each year in Tokyo, Osaka,Nagoya, Fukuoka. The competition is concluded in accordance with traditional rituals such as ring entrance ceremony by wrestlers in the makuuchi ( the top division of the six divisions of professional sumo) and yokozuna (grand champion) divisions,and bow -twirling rite. The wrestlers wear chonmage (top knot) but to be able to wear chonmage, he must be above jyu-ryou rank. He would wear oicho style topknot). The wrestlers is given chikaramizu (water) , sprinkle salt over the ring,and perform the shiko (lift his leg,stamp his feet), in the middle of the ring,facing toward the opponent. The wrestler takes his place and sprinkle salt over, and over til time limit is reached. The eight win of each tournament are called kachikoshi, and the eight losses are called makekoshi.Both effects ranking of the wrestlers. For Maku uchi, The wrestlers names are lined up from right to left: highest ranking to the lowest ranking; yokozuna-ozaki-sekiwake-komusubi-maegashira. For Juryo, The ranks above jyuryo are called sekitori, who receives monthly salaries from Japan Sumo Association. For Yokozuna, The highest rank of all wrestlers, yokozuna will not be demoted by the consequences of tournament but if the result turns out to be bad, he could be forced to retire. Chanko Nabe is a hot pot dish sumo wrestlers eat as staple.It got variety of vegetables, meat, and seafood. Retired wrestlers tend to open up the restaurants with specialty of Chanko Nabe. It might be fun for you to try out one of those restaurant if you happen to be around the Ryogoku area (Tokyo). Sumo wrestlers used to be mostly Japanese but recent years, you can see more wrestlers from outside Japan;Mongolia, USA, China,Russia,European countries etc. To read more on Sumo at Japan guide website, please click here. To read more on Sumo at Time website, please click here. Japan has many castles throughout the country. There are many types of castles in Japan. Oldest castles were built using mountain and called “kodai san jyo u” ,which was mainly the type of castles to protect the attack from China. Another one was called “chu u sei san jyou”, and it was type of castle during the era of Takauji Ashikaga and Masashige Kusunoki;kamakura/ Muromachi era. The castle that was mainly for the use to protect the castle from outside attack (jyou kaku) was built on top of the mountain, and lower part of the mountain had “ki jyou”;the castle the owner of the castle lives in. It is said that the castle using stones to protect the castle from outside attack was popping up around Nobunaga Oda (Shogun) era and he was often known to invented the tensyu kaku; the castle tower. If you count the number of castles built during Hideyoshi Toyotomi, Ieyasu Tokugawa (shogun), there are more than 40,000 castles were built in Japan. Castles style and introduction to guns.. Guns were introduced to Japan in 1543,which led to the abrupt change in war style. After guns were introduced, castle’s lords built the modern castles you are familiar with, and defend themselves from the enemy. Well known Azuchi Castle,which was built by Nobunaga Oda in 1576 was the first of its kind to have the castle tower and, it became the characteristics of modern castles today. Castles were residence of lords, as well as centers of the politics and economy. Tenshu is main tower, and it was located in the main castle enclosure, (hommaru) , and outside of the building was of white plaster. Strategic points were equipped with gun ports and stone-dropping ports. Gun ports: The castle tower had peepholes and it allowed the guns to be use through the holes. To facilitate sighting the enemy more easily, the holes were bigger inside than the outside. Stone-dropping ports: A corner of the building protruded such that the stone could be dropped on enemies attempting to climb up the stone walls around the castle. You can also notice that many modern castles got ditches (moats) around the castle stone wall so the enemies cannot easily come attack the castle. 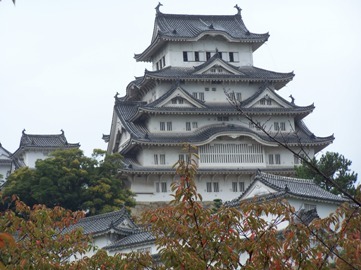 Popular modern castles in Japan include Himeji castle (shiga prefecture, and it is a world heritage site), Matsumoto Castle (Nagano prefecture), and Kumamoto castles (kumamoto prefecture). When we visited Japan, my father took us to Himeji castle and other time when we visited, my father took us to Matsumoto castle in Nagano prefecture as well. You can read more on Japanese castle and also can see some pictures of popular castles in Japan at Japan guide website here. Yu can also read more on castle at Japan visitor website here. You can read more on Japanese history of castle and types of castle at castle and manor house website here. Temple houses Buddhist statues,which people pray to,especially during bon festival (mid August) or equinox week when people visit their ancestors’ graves. People also visit temples on New Year’s Day to wish for happiness and health in the coming new year. Temples have facilities for training the monks, as well as for housing and feeding them. The Buddhism was introduced from China around 6th century and, Prince Shotoku Taishi has accepted it, and implemented it into his government systems. Prince Shotoku Taishi is known as founder for 17 article constitution. You can read the 17 article constitution in PDF file here. This article #1 especially is valued and being taught in Japan as common moral, and it is our trait. Our culture value “wa;Harmony”, and it is coming from Prince Shotoku Taishi. Japanese laws, rules, customs and manners tend to go out of their way to avoid conflict. Good example might be, Honne (True feeling) vs Tatemae (Public face feeling). Japanese society expects people to hide their true feelings in many circumstances in order to be polite. More on Honne vs Tatemae at Japan talk website here. Also you can read more on it at ufl website here. More on “Wa” at PBS website here. When you visit temple, first, you go through chumon;the gate located in the center. Normally, if you walk through the gate and go straight, the building all the way back is the building called “Kodo”,which is the place to study Buddhism. This Kodo is connected to library called “Kyozo”.This library keeps sutras. That Kodo and the gate, Chumon, is connected by corridor called “Kairo” and it extends to east and west and then turn to north to connects with Kodo. Inside the temple land, you will find “shoro”;bell tower, in front of kodo building at one side corner. Then you would see “Gojyu no tou”; Five storied tower. The closets to the gate, you will find Kondo; building where budhhist statues are kept. Many Buddha statues are inside the building but one in Kamakura is kept in an open field because of fire they have experienced long time ago. The temple is called “kotokuin”.You can see the big buddha in the wide open field. Here is the official website in English for you to read more on the temple.It might be interesting place for you to visit. Besides nyorai and bosatsu, there are also the myoo/tembu style of Buddhist statues. The statues are usually made from metal or from wood. Nyorai depicts the Buddha after retiring into religion, so it is not adorned with personal ornaments. The statue’s background material is called kohai (Halo), and the statue wear the robes called “Noe”. Then, the statue is sitting on lotus petals called “Rengeza”. Bosatsu depicts Buddha before retiring into religion so it is adorned with many personal ornaments. Bosatsu statue would have water container called ” Suibyo”, and also wearing scarf called “Tenne”. If you have a chance to visit Kyoto in Japan, Kiyomizu temple is the great place to visit. Ninja is very popular in many parts of the world and, you would hear the word “Ninja” in many media sources such as TV shows, movies, magazines, novels.. and most people would know what it means and who they are. Ninja is very popular among tourists to Japan, but also Ninja is very popular among Japanese culture as well. In this entry, I would like to focus on the Ninja culture in Japan. In Japan, there is a novel that deals with ninja called “Owl’s Castle” (fukurou no shiro) written by Ryoutarou Shiba.It is well known novel and a couple of movies were made based on the novel this year as well. Ninja is a spy if you will, in our modern world. Ninja were engaged in espionage activities during the war. They worked under shogun/Daimyou and tried to collect information from the master’s enemy etc. to bring the victory home in the war. They used special tools and weapons with which to carry out their missions. Ningama; Ningama entwines the enemy’s weapon with a chain and cuts it off with a sickle. Shuriken; Shuriken are pointy sharp edged devices for throwing, end- over- end, at the enemy. It is said to be around Shoutoku taishi era around 587 when very first shinobi (Ninja) was used. Syoutoku Taishi used Otomono hosohito as very first shinobi/Ninja. Then, the term “Nninja” was created around 683. By 1540, there is a record that let us believe that there were 11 great skillful Ninja were existed in Kouka area in Japan. Since then, there are some events involving Ninja such as burning down the enemy’s castle etc is recorded in our Japanese history. This is Japanese website but if you are interested, you can check out the history chart focusing on the Ninjya history here. Did Ninpou (transformation technique) really existed? When you watch animation or movies, Ninja sometimes changes its formation in the smoke, but it is fictional method created for the novel and this technique did not exists in the real life. Who is “ku no ichi”? “Ku no i chi” is female Ninja. When you write “くノ一”, it makes chinese character meaning female. Therefore, female Ninja was called “Ku no i chi”. What kinds of food Ninja used to eat? According to the nja2 website, it says they consumed products largely made with soybeans. In Japan, soybeans are considered “meat in the field” and it contains large amount of plant base protein and it was the very important ingredients for those who did not get to eat as much meat as protein source. It is believed that soybeans would rest your body well, and great for muscle growth, and works good for better skin and Ninja preferred the ingredients as main. Nnja also ate a lot of sesame that got large amount of minerals and it also improve the metabolic effect,along with brown rice that is high in fiber ,high in vitamins. I came across interesting article written by Ishaan Tharoor on Ninja. To read the article, please click here. If you are into Ninja things, Japan has interesting places you can visit. There are several places with Ninja theme parks. Ninja House in Shigaga prefecture (western part of Japan in the main island). Park website is here. The website is in English. Edo Wonderland in Tochigi prefecture (middle part in main island in Japan). Website here in English. Iga ryu NInjya House in Mie prefecture (middle part in main island). Park home page here in English. Kouka Ninja Village in Shiga Prefecture (Western part of Japan in main island). Home page here. Not English website. Touei Eiga Mura in Kyoto (western part of Japan in main island).Park home page here in English. In fact, I happened to come across the name of sushi restaurant called “samurai sushi” while browsing through the internet. The word “Samurai” for sure seem to be well known by people in the states. However, one thing that I would like to caution Japanese sushi restaurant owners is that, they should look into the meaning very well or they get funky name for restaurant. Like.. there is one sushi restaurant,which we have been to but not really been impressed by them. Well, this restaurant name is “Umi”. When I saw the sign, I had to laugh because if you say “U-mi,putting accent on U sound, it means ocean”, but if you say u-MI, putting accent on Mi sound, it means pus (yuck). Some Japanese words have 2 meanings depending on how you put the accent on.It changes the meaning to totally different thing. Anyway, can you explain what samurai is? Samurai is government official title/ a member of a powerful military caste in feudal Japan, especially a member of the class of military retainers of the daimyos,who are the great lords who were vassals of the shogun. Shogun is a hereditary commander-in-chief in feudal Japan. In this entry, I would like to introduce armor and weapon by Samurai. Armor, helmet, swords worn by Samurai were not only used during the battle but also were time honored hand crafts,to be appreciated for their workmanship and the dedication of their makers. Ka-cchu-u (armor and helmet) is known as o-yo-ro-i. It came into use in around 9th century.And it was the armor for Samurai. The golden large flat metal pieces on the helmet is called Ku-wa-ga-ta. The armor they wear is called o-yo-ro-i. Yo-ro-i got o-so-de (arm guard), se-n-da-n no-i-ta; right chest protector, Kyu-bi-no-i-ta ;left chest protector, tsu-ru-ba-shi-ri; smooth leather covering, Ku-sa-zu-ri; segmented leather and they are hip and thigh guard. You can read the history of Yoroi here at wikipedia website. Samurai primarily used arrows and sword. The Japanese sword is made distinctly for cutting.Therefore, it is single edged and curved. Generally, hilt is long and made to be held with both hands. I came across History channel’s documentary show on Samurai history on youtube.Nice piece to learn more about our country. If you are a blog subscriber, please click here to watch the video at youtube website. By the way, my ancestor’s father had a castle in Gifu prefecture which is in main island of Japan. He was going to give the right to take over the castle to my ancestor, but he gave the right to take over the castle to his younger brother. I only know the story just that and I wonder what happened to our ancestor after passing the right to take over the castle. I heard about the story from my father but, I have no idea how much more he knows. I found it interesting. I wonder what my ancestor ended up doing for life. I also found that Tokyo has Samurai museum if you are interested;near Shinjyuku station.